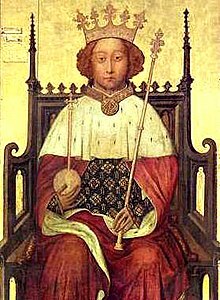 The Tragedy of King Richard the Second is a play written by William Shakespeare around 1595 and based on the life of King Richard II of England. It is the first part of a tetralogy referred to by scholars as the Henriad, followed by three plays concerning Richard's successors: Henry IV, Part I; Henry IV, Part II; and Henry V.
Old John of Gaunt, time-honour'd Lancaster. John of Gaunt: What is six winters? they are quickly gone. Than when it bites, but lanceth not the sore. Writ in remembrance, more than things long past. For violent fires soon burn out themselves. Fear'd by their breed, and famous by their birth. He fires the proud tops of the eastern pines. A little, little grave, an obscure grave. O, that I were a mockery king of snow. Thinking his prattle to be tedious. To thread the postern of a small needle’s eye. King Richard, Scene V; variant: "To thread the postern of a needle’s eye." Nor shall not be the last.